There are numerous trusted manufacturers that supply high-quality construction chemicals to their customers. These chemicals are made available to the customers in proper packaging, and according to their requirements at competitive prices. The construction chemicals are in high demand as they are used extensively on construction sites as well as in other related areas. With the use of machinery, in addition to the best unfinished material, are the construction chemicals that are processed, and offered to clients. Customers can buy these construction chemicals, according to the specifications required from the Construction chemical manufacturers at competitive prices. We offer Painter Putty to our clients which consist of a wide range of colors in white and gray powder. These are manufactured, supplied and exported by usage of standard material which is efficient and reliable in application of wall. It is mixed with a sufficient quantity of water to make it a smooth paste for applying on walls to level the surface walls before painting. They can be applied in single or double coating as per the requirement. These are offered at cost effective prices. Creation of smooth surface for application of paint to the walls and ceiling. It can be used on plasters, RCC, brick or block work directly. Clean the surface to remove dirt, dust, capacitance, oil, grease etc. Dampen concrete or the plastered surface before application. If the plastered surface has pores treat surface with SBR diluted with water so that all the pores are primed then apply putty made to a flowing consistency so that all the pores get filled up then apply putty. Mix 350 to 390 ml of clean water to 1 kg Perma Plaster Putty. Mix thoroughly and keep it for 5 to 10 minutes and remix to obtain an even consistency creamy paste. Apply this paste on the plaster or concrete surface with Spatula or putty blade. If there is a need to build up thickness it can be applied in layers taking care to see that the first layer has dried before the second layer is applied. One day light curing may be considered for optimum result. Sand paper the surface next day to perfect evenness with sand paper no 500 and dust clean before application of paint. Perma Plaster Putty white/grey is available in 1 kg, 5 kg, 20 kg & 40 kg multi wall laminated sacks. 9 months if stored in manufacturers original packing. 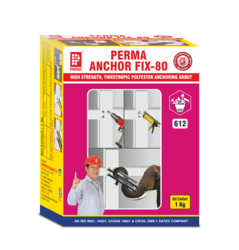 We Offering Polyester Resin Based Anchor Grout i.e Anchor Fix - 80. A polyester resin based grout which is used in locations where very high early and ultimate strengths are required along with chemical resistance properties. The product is supplied in pre measured two component units. Most of our Polymerized Cementations Putty is provided on based on the customer’s requirements. These are used to provide a smooth surface of wall before painting. Our product is provided utilizing premium grade material and sophisticated technology. These are highly demanded and are availed at affordable costs. It is very accurate in easy application on walls which is also suitable for direct application on brick work in interiors. Perma Plaster Putty Gold is a very fine quality powder putty with high polymer content and very refined fillers. This provides an ideal base for expensive and good quality paints. We are the prominent manufacturer and exporter of high-quality Concrete Floor Dust Proofer which is widely used for the floor which is used for commercial purposes. They harden the floor with its concrete mixture applied to the floors that are simple to use, dust proof and durable for a long time. Clients can avail these at competitive rates as per the standard norms. Our esteemed clients can avail an exclusive range of Multi Purpose Flexible Sealant at cost effective prices. It is applicable for sealing the crack at joint beam, brick work, around windows and doors. 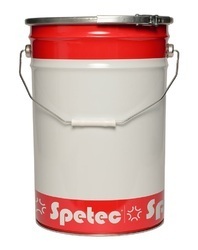 This sealant is also used as plastering while painting the walls. We manufacture them with the standard quality material that is smooth and high strength in nature. This can be easily applied and dried fast. Perma Acri-seal is an acrylic sealant available in brilliant white colour for sealing gaps around window and door frames, Styrofoam board, particle board panels etc. It can also be used for sealing fine moving cracks at the junctions of column /beam and brickwork and for sealing general cracks in plasters prior to painting. Can be used to seal the annular spaces in collar joints of sanitary plumbing and to seal the junction of pipe joints. To seal all joints in CI, GI AND PVC tubes. Excellent adhesion to most substrates. Water based, hence environmentally safe and non toxic. Take sealant paste and apply in to the base of the joint so that it completely fills the joint. Tool the surface immediately after sealant application to provide a smooth even finish. We are engaged in offering a comprehensive range of Concrete Curing Compound to our clients. To make stronger the surface of concrete we spray this curing compound which helps in premature drying out. They are available in the form of water which consists of hydration agents for cement based on best conditions. Permacure WB White is a pigmented wax based emulsion for retaining water in concrete for effective hydration of cement. Permacure WB White provides a highly economical and efficient means of retaining the water in fresh concrete. The presence of water is essential to ensure the strength development in concrete. The membrane formed by PERMA CURE WHITE prevents concrete from premature drying out and therefore enables the process of hydration to proceed under optimum conditions. As a consequence,the finished concrete has a harder. dust free surface whilst drying shrinkage and crazing (hair cracks) are reduced to a minimum. Initial white color shows areas of use. Perma Cure WB White should be spray applied as evenly as possible to the freshly placed concrete. 1 LTR.covers 50Sq.ft. of area. Permacure WB White is available in 20 & 210 LTR. Packing. Presents no hazard. Low toxicity. In case of accidental ingestion do not induce vomiting. Give milk or warm water and seek prompt medical attention. Spillages can be absorbed with sand or earth and disposed off. One year from the date of manufacture if stored original packing. All "PERMA" branded products are manufactured under strict quality control supervision as per exact manufacturing specification. Should you find the behaviour of the product varying from the claims in the data sheets please stop the use of the product and contact the nearest PERMA staff or distributor. PERMA branded products when used in accordance with its current published directions for use performs as per its data sheets. The manufacturer and the distributor will not be responsible for other materials and conditions of inferior workmanship. 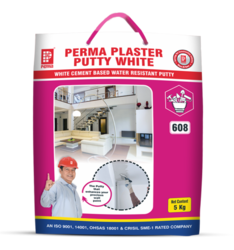 Perma Plaster Putty is a fine powder in white and light grey colour based on ordinary Portland cement/ white cement, selected polymers and fillers. This product provides a final surface for application of paint on to the walls and ceiling. This product can also be used for exterior application. Creation of smooth surface for application of paint to the walls and ceiling. It can be used on plasters, RCC or brick or block work directly. Cleanthes surface to remove dirt, dust, laitance, oil, grease, etc. Dampen concrete or the plastered surface if it is very dry or wherever required. Mix 350 to 390 ml of clean water to 1 kg Perma Plaster Putty. Mix thoroughly and keep it for 5 to 10 minutes and remix to obtain an even consistent creamy paste. Apply this paste on the plaster or brick or block work or concrete surface with spatula or putty blade. If there is a need to build up thickness it cane applied in layers taking care to see that the first layer has dried before the second layer is applied. One day light curing may be considered for optimum result. Sand paper the surface next day to perfect evenness with sand paper no. 500 and dust it clean before application of paint. Perma Plaster Putty white / grey is available in 25 Kg multiwall laminated sacks. Wax Based Concrete Curing Compound We manufacture Perma Cure WB White provides a highly economical and efficient means of retaining the water in fresh concrete. The presence of water is essential to ensure the strength development in concrete. The membrane formed by Perma Cure WB White prevents concrete from premature drying out and therefore enables the process of hydration to proceed under optimum conditions. As a consequence, the finished concrete has a harder, dust free surface whilst drying shrinkage and crazing (hair cracks) are reduced to a minimum. Water cut-off large flow and high pressure water leaks. Water cut-off water leaks in foundations such as diaphragm walls, pilling sheets and secants piles. Stabilisation and water cut-off of large cracks, voids and gravel layers. Pre and post injections in mines, tunnels, pipes jacking, drills and blast and TBM applications. Injections in combinations with cement-based grout. Crack and gravel layer injections in concrete structure. Soil stabilisation and anchors in pours geology. Water cut-off of sewer water leaks and sewer stabilisation. Different reaction times are possible by adjusting the percentage of SPETEC PU H100 ACC accelerator. Cured polyurethane exhibits high strength and good chemical resistance. We are one of the renowned manufacturers and suppliers are engaged in providing a comprehensive variety of Floor Hardening Compound to our national as well as international customers. These are easy and fast to the application that is safe and abrasion resistance. We offered to our clients for floor hardening which is widely used in industries and domestic applications. This insulation compound is chemically cross-linked and is helpful in providing a good look to the floor. 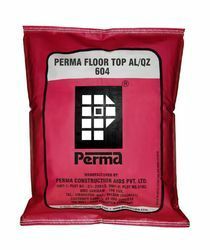 Perma Floor Top is a floor hardening compound based on non-oxidizing metallic or non metallic aggregates a blend of ordinary port land cements and activating chemicals. Perma Floor Top is for use on green concrete of industrial floors to achieve high abrasion and impact resistance properties on the finished floors. Depending up on the selection of aggregates Perma Floor Top is available in two grades. Perma Floor Top AI:Based on non-oxidizing metallic aggregates. Perma Floor Top a z: Based on non-metallic aggregates. Perma Cure WB i.e Wax Curing Compound which is is a white pigmented wax based emulsion for retaining water in concrete for effective hydration of cement. 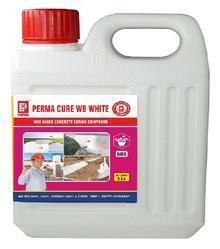 Perma Cure WB White is available in 5 litres, 10 litres, 25 litres and 100 litres packing. Perma Curing Compound White provides a highly economical and efficient means of retaining the water in fresh concrete. Looking for Construction Chemical ?